About a month ago, Devil May Cry creator Hideki Kamiya published his opinion on the current state of 3D action games. Paraphrased, they’ve apparently stood still in terms of design and execution since the original DMC. When I first read that, I dismissed it as him just being cocky, or perhaps simply really excited about his upcoming title, Bayonetta. However, after playing Ninja Gaiden II, and reflecting on all of the other 3D action games I’ve played up until now, I’m beginning to think he just might have a point. Very little has changed. I’m still running around, slashing things, collecting orbs, solving puzzles and repeating the process; and after this many years, it’s finally become less satisfying than it used to be. Ninja Gaiden II is almost the same game I played nearly six years ago. There are, however, some differences. The graphics are better. The glitches are higher in number. The bosses aren’t worth writing home about anymore. There’s a lot more blood. The camera actually is really bad now. Platforming doesn’t quite work the way it should, nor does swinging from bars. The story has turned from a cool tale of ninja revenge to… something fairly ridiculous. 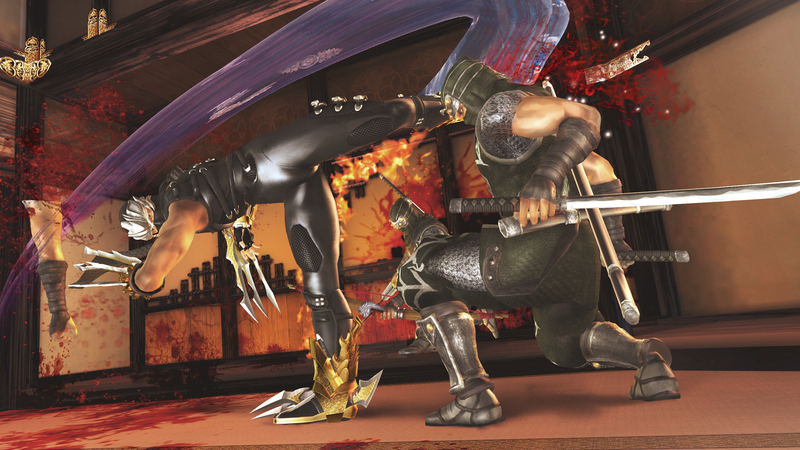 Antiquated design abounds in this new version of Ninja Gaiden, and none of it is for the better. Despite the wonderful graphics, many environments are, in truth, a series of simple, connected rooms, with too many invisible walls to count (the New York stage is a repeat offender here). 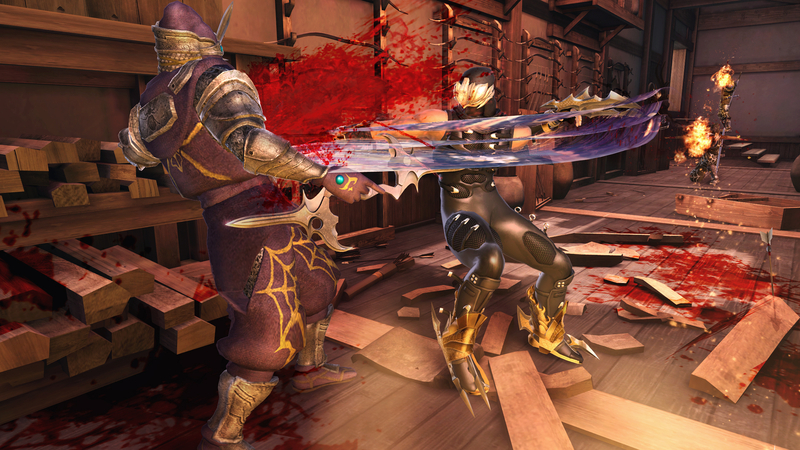 The only significant new combat mechanisms are dismemberments and the insta-kill Obliteration Techniques. Both are welcome, though the latter feels a little bit cheap. The regenerating health system is also very welcome, but again, may feel a little bit cheap, especially to veterans of the original title. Meanwhile, the game features all of the weapons and ninpo magic from the first game, with very few newcomers to be seen. Then you have this title’s single major downgrade, which is the “puzzles” not being actual puzzles at all. Allow me to digress here for a bit, with a mini-rant. Yes, there’s something to be said for linearity, and “just getting to the point,” especially considering that many game designers deem it necessary to pad out their games with things like pointless fetch quests. But please do not insult me by presenting me with a locked door, and then having the key be a simple zero-to-two rooms over, in its very own treasure chest that’s easily visible because it’s situated away from everything else. Moreover, please do not do this to me more than three times and expect me to not get annoyed. If you’re going to put obstacles and puzzles in your game, either do so correctly, or just give me waves of enemies to cleave from start to finish. As it stands, even DMC4, with its toned down puzzles and mazes wasn’t nearly this bad, and both God of War console games are excellent in terms of its mental exercises. Anyway, even given all of its shortcomings, it’s a testament to the series as a whole that this game still manages to be quite fun, and a quality experience. It’s got several great blood-spattering moments and the tension that you feel when you enter every battle is off the scale. Thanks to the regenerating health system, fewer tasks seem insurmountable, and when you lose you know it’s always due to a personal lack of skill that you must practice to overcome. The weapons, despite being recycled for the most part, ensure that every run through the game is a unique experience. Equipping a new weapon isn’t simply an exercise in switching combo mechanisms—it’s switching an entire martial art. It’s worth leveling up every single one to find out all of the new ways you can cut through everything in your path, if only so that you can use the new Ninja Cinema feature to show it off to your buddies. A good Ninja Gaiden II player is guaranteed to please any crowd he or she so wishes. Once you get the combat down, though, there’s little else to the game, and that’s its Achilles’ heel. Sure, I can flip out and kill things like a ninja, but what about sneaking like a ninja? What about running and jumping like a ninja, fluid and free? Anything not related to combat in this game (and there isn’t much of it) is stiff and unwieldy. I’m sure real ninja don’t have to worry about falling off of high platforms 50 percent of the time. This game could have done so much with the ninja concept, but we’re left with nothing but cutting through hordes of baddies. The majority of this review may carry a negative, disappointed tone, but allow me to stress that Ninja Gaiden II is not a bad game, nor is it a broken one. It’s actually one of the best that the Xbox 360 has to offer, and easily worth your money. However, given its pedigree, certain expectations were made of this game by pretty much everyone who played the first, and this game resoundly fails to meet them. A title such as this could have, and should have, been so much more. As things are, Devil May Cry 4, repeated boss rushes and all, showed me a much better time.